The Career Resource Center (CRC) held its 11th annual Internship Recognition Ceremony on April 15, as representatives of the many different groups that make SUNY New Paltz student internships possible – regional employers and educators, College faculty and, of course, the students themselves – joined together to share a meal and pay tribute to the many different ways students can gain hands-on experience with College faculty and regional schools and businesses. 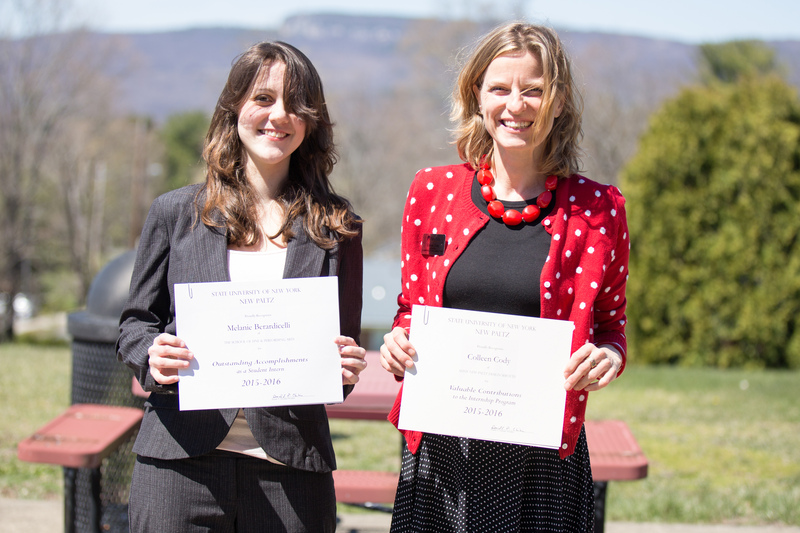 During the 2015-16 academic year, New Paltz students interned with companies and organizations including Novartis Pharmaceuticals, the Wallkill Valley Trust, Esquire Magazine, Central Hudson Gas & Electric Corporation, the Rosendale Police Department, Time Warner Cable, the Woodstock Film Festival, Viacom and the office of the Ulster County Executive. Others student-taught at school districts in Ulster and Orange Counties. Forty-one attendees of the reception were presented with awards for their role in the student internship experience – students for their hard work and motivation; employers and school districts for offering support, guidance and an enriching internship experience; and faculty supervisors for developing and facilitating internship opportunities for students. “Today we honor a lot of different groups of people: student interns and student teachers; our faculty, who have gone above and beyond to help our students receive these wonderful experiences; employers, businesses and school districts, to whom we offer our sincere gratitude for their guidance and mentorship of our students,” said CRC Internship Coordinator Beth King. More information about student internship opportunities is available at the website of the Career Resource Center.